July 10, 2015 marked the 175h anniversary of the maiden voyage of Cunard’s flagship Britannia and its first crossing from Liverpool, England to Halifax, Nova Scotia. In celebrating this occasion, the Maritime Museum opened Cunard 175: Engine for Change, which coincided with the arrive of Cunard’s current flagship, Queen Mary 2! For continual updates on this special exhibit, related events and programming, follow our Facebook and Twitter! Cunard 175: Engine for Change is the Maritime Museum of the Atlantic’s celebration of Sir Samuel Cunard’s vision and achievement in revolutionizing maritime travel and global communications. His drive to create an “ocean railway”—with comfortable, technologically advanced ships making established oceanic passages–is continued by today’s Cunard Cruise Line. Follow Cunard’s remarkable rise, from Samuel’s early involvement in privateering, to the line’s remarkable service in two world wars, to the glory days of modern liner travel. 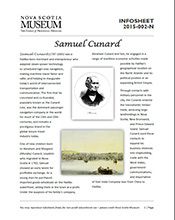 Starting from humble beginnings in Halifax, Cunard created a communications network that spread across the British Empire and around the world. At the museum you can experience the hands-on sights and sounds of ocean-going technologies that changed the world. Experience what it was like on the Halifax waterfront in Cunard’s early days of commerce in the timber, mining and beginnings of the ferry system we use today. Cunard’s growth in the shipping industry traces its beginnings back to Halifax as a prime Canadian port. From bringing immigrants to find their new home in North America to the role in war time and conflict in international waters, the Cunard ships were innovative vessels in communicating and connecting. Visitors will be able to send messages throughout the museum and around the world with voice--‐pipe communication and wireless radio, in addition to working with huge steam engine models as part of the experience in celebrating Cunard’s accomplishments! da Vinci College students are proud to contribute their skills for this exhibit at the Maritime Museum of the Atlantic. In partnership with the museum, students from the Animation for Game, Film & Visual Effects and Audio Engineering programs have recreated Samuel Cunard's steam-powered RMS Britannia of 1840 using digital modeling and animation techniques. Over several months, our students have worked closely with the Museum to produce an engaging and educational animated video piece describing the changes in maritime technology.